Last Friday I was in one of those 'yay it's the end of the week' moods that pretty much anybody who has some regular work looks forward (or in the case of some of my friends, Friday/Saturday since their schedule has them working Sun-Thurs). That in itself isn't special since I get in that mood pretty much every Friday, but it was also combined with a bit of a 'I wanna splash-out a bit on lunch' mood that accompanies a successful working week. What made this week particularly successful? Well for the first time in 2010, I have reduced my workload to only a handful of items; after almost a year of having too much to do, I can finally count the number of things I have to do at work without having to require a second digit. 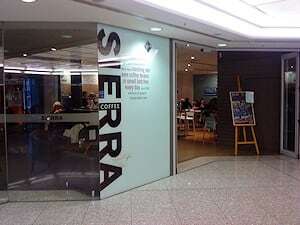 So for lunch that day, I went to one of my favourite feeling-like-spending-a-bit-more-on-lunch places, Sierra Cafe. A normal spend on lunch for me is around $8 NZ. Anything above $10 means I'm either buying a drink (I often bring my bottle of water) or having lunch with the workmates. And if I'm spending $15+, then I'm feeling rich for no particular reason and am 'splashing out'. The meals that I go for at Sierra are definitely in the $15+ range. I don't often go to Sierra or places like it, simply because if I kept spending too much on lunch I'd run my own budget into the ground. I more often find myself at fast-food places, especially those at the food court near my work, and it's at those places I'm not too surprised that I've been recognized by the staff as a regular there. I can think of 2 places at that food court where the people behind the till can recite my order to me before I even open my mouth, and there's been one time in recent memory where being a regular got me special treatment. So it surprised me that Friday lunch time when the guy behind the till recognized me as someone who likes going there. He also noticed I'm not a coffee person (when I do go there I usually get one of the fruit smoothies) so he got me a coffee card, said I could use it to purchase any drinks whenever I'm there, and before he handed it to me he stamped about 8 of the 10 stamps you need to get your free drink, saying "That should make up for all the other times."